The University of Florida ranking is 41st best in the USA and 82nd in the world on the University Review College Ranking Lists. It is ranked as the 48th best college nationally by the USnews. 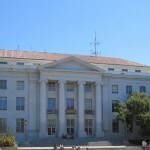 It is ranked as the 87th best college in USA by Forbes. The University of Florida tuition fees are $6,313 for in-state and $28,591 for out of state students. It is a selective college taking in 46.5% of applicants. Financial aid offered totals $176 million per year, an average of about $12,700 per student. SAT scores for admission requirements (25th-75th percentile) are Math 590 – 690, and Reading 570 – 670. The composite SAT scores range from 26 to 31. The requirements for ACT (25th-75th percentile) are Composite 24 – 30, English 25 – 31, and Math 25 – 30. The University of Florida was founded in 1853 after a state funded takeover of Kingsbury Academy in Ocala, it was then implemented as a public state institution and relocated following the Buckman act in 1905. It is situated in a campus of around 2000 acres in Gainesville in the south east of the USA. The institution has 16 colleges and over 100 different undergraduate degrees and 200 postgraduate programs. There are around 34,500 undergraduate students and approximately 15,000 postgraduate scholars, in addition to the 5,200 staff and faculty; this makes the institution the fourth largest in the US. The University of Florida, Gainesville, FL has an endowment of 835 million US dollars. The president is J. Bernard Machen. The schools mascot is Albert E. Gator, and the sports teams are known as the gators. The libraries hold over four million bound volumes, and over seven million microfilms. It is a member of the Association of American Universities. University of Florida photograph by Dan Smith. 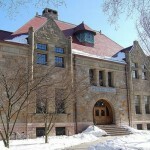 As it is one of the Public Ivies, the education offered is similar to found at places like University of North Carolina at Chapel Hill, University of California, Irvine, University of Minnesota, Twin Cities, and The Ohio State University. 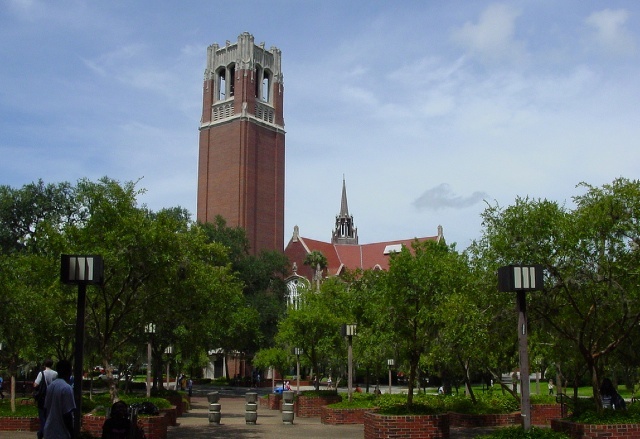 Other colleges in Florida state include the University of Central Florida, Florida International University, University of South Florida, Florida State University, and the University of Miami. Motto: Civium in moribus rei publicae salus, (The welfare of the state depends upon the morals of its citizens). The university of Florida ranking is as the 125th best in the world by the THE.